Credit: Image courtesy of GE. GE is using an innovation for manufacturing fuel cell technology as the backbone to launch an independent startup within the conglomerate, the head of the group, Johanna Wellington, told me in an interview on Monday. The 17-person GE team is now in the process of working on scaling up the fuel cell tech as well as the pilot production line, and plans to commercialize the product as early as 2017. Fuel cells are big boxes that can generate energy through a chemical reaction. They operate a bit like a battery but instead of storing energy, they actually create energy through a reaction oftentimes using hydrogen and oxygen as a fuel source. GE has been working on fuel cell technology for decades but a few years ago its researchers discovered a new way to manufacture a key piece of the fuel cell. Fuel cell boxes are made of stacks of metal plates that are coated in a catalyst material that triggers the energy-generating reaction. Oxygen and hydrogen flow over the stacks and the catalyst. GE’s fuel cells use a ceramic combination for the coating. Usually companies sinter these layers onto a metal sheet to make the stacks, but GE’s innovation is that it figured out a low cost way to spray the ceramic layers onto the stacks. The spray technique was a technology that GE was using for coatings for jet engines. It’s an additive process that deposits three layers of the coating onto a metal sheet that makes up the stacks. Wellington tells me the spray method lowers the cost of making the fuel cell significantly, but GE declined comment on how much the product would cost when it’s available commercially. When it eventually becomes a product, the fuel cell will actually be paired with a Jenbacher engine to make a hybrid fuel cell. The engine helps the fuel cell operate much more efficiently, and Wellington tells me that GE’s hybrid fuel cell will be 65 percent efficient. The idea is that retail operations and industrial customers — like a data center operator — would want to use this type of distributed clean power. Apple and other data center companies have bought fuel cells from Bloom Energy for this type of use. GE thinks the fuel cell hybrid device is important enough to get its own separate company working on it. Wellington says that the startup model is an opportunity for GE to have the team work solely on the product and be able to operate quickly and nimbly. It’s a new business model for GE and it’s funded by GE’s venture arm GE Ventures. Wellington declined to disclose the amount of funds supplied to the startup. GE is hiring at its fuel cell startup in New York, and plans to grow to 30 people eventually. GE – â€œItâ€™s almost impossible to do a good fuel cell without platinum as a catalyst,â€ Vlatko Vlatkovic, chief engineering officer of GEâ€™s Power Conversion division, said in an interview in London. What Vlatkovic seems to be missing is that there are Molten Carbonate Fuel Cells as in “Worlds Largest” that DO NOT USE PLATINUM! What is the value of this system? Video (Someone took down the video but the article still there) below of what is happening in California at municipal wastewater treatment plants using fuel cell technology to produce 3 value streams of electricity, hydrogen and heat all from a human waste! This is pretty impressive in my opinion for hydro-refueling infrastructure. I think you are confusing your fuel cells, the SOFC GE are developing, much like the MCFC, is unlikely to use platinum either. The cells that they are talking about in the article you highlight are PEM fuel cells which do use platinum, much like the catalytic converter on a car. FYI, GE had an old long running Solid Oxide Fuel Cell program beginning in about 1990. They announced their MW class fuel cell would be available in five years at that time, gave the 5 year warning again in 1995, 2000, and 2005. They received large federal subsidies over that period as part of a long running SOFC development program, but essentially gave up around 2009 or 2010 without even coming up with a large scale prototype. Other major program participants including international power plant and engine designers like Siemens and Rolls Royce also failed to follow through while Silicon Valley start up Bloom Energy (the former Ion America) did manage to come up with their own investment capital and produce a marketable albeit nowhere near profitable SOFC product to supply commercial capacity (100 kW) clean efficient power. GE have been developing fuel cells since the 1950-60’s, they have had their ups and downs including producing the “fuel battery” for the Gemini space program and making a number of direct hydrogen small scale power units for demonstrations amongst a wide array of other things. The fuel cell program today appears to have little in common with the monolithic designs of the 1990’s. I agree, 2017 appears quite aggressive but I wouldn’t write off the GE effort just yet. In a similar vain Rolls-Royce’s effort is alive and moving but is now South Korean, LG fuel cell systems. Siemens high temperature program has come to an end but, IMO, to use one of the more successful fuel cell companies (they produce fuel cell submarines for 2 or 3 navies now, ok, low temperature fuel cells not high temperature fuel cells but fuel cells none the less) as an example of why fuel cells are a bad idea is a bit ironic. In addition to Bloom, Kyocera and CFCL are also producing high temperature ceramic fuel cells. 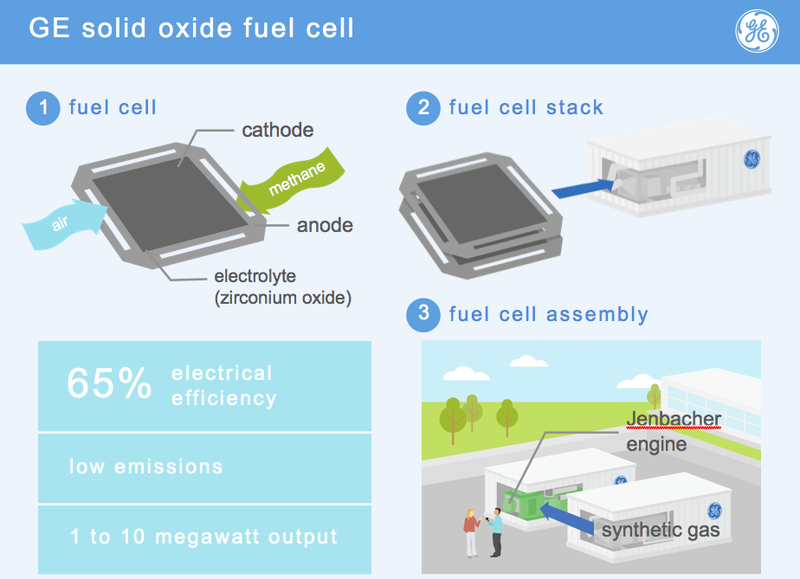 Fuji and FuelCell energy (neither SOFC manufacturers) are making 100kW+ class fuel cells for stationary power. I personally welcome GE’s effort and hope that they can pull it off.